AzhwAr was asked as to why he was saying that there is no one to be attained other than emperumAn. Isn’t rudhra (Siva) appropriate to be attained? AzhwAr says that since rudhra is also the body for emperumAn, he is also protected by emperumAn only, like all the others. rudhra has nothing common with emperumAn, other than being body (rudhra) and soul (emperumAn). All the entities are sustained by emperumAn only. If one looks at the qualities of rudhra, it would be clear that he is being protected and emperumAn is the protector. ERRAn – Sivan is famous for having bull as his vehicle. eyil eriththAn – Siva had burnt down the towns of his devotees, in order to get the title of having burnt three towns. mArvidandhAn – emperumAn transformed himself as narasimha (lion head with human body) in order to kill the enemy, iraNiyan (hiraNya kashyap), of his devotee prahlAdha. 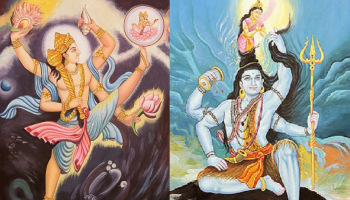 kURRorupAl mangaiyAn – Sivan has his consort pArvathi on one half of his body and feels vain because of that. vAr sadaiyAn – appropriate to the penance that he is carrying out, Sivan has hanging, matted hair. nIL mudiyAn – emperumAn has long crown, which signifies that he is the lord of all the worlds. gangaiyAn – Sivan bears gangA on his head, in order to purify himself. nIL kazhalAn – emperumAn has divine feet, which are the source for that gangA. The meaning conveyed here is that emperumAn, with all the characteristics mentioned above, is the protector for Sivan, with his own set of characteristics as mentioned above. We shall move on to the 75th pAsuram next. This entry was posted in iyaRpA, mudhal thiruvandhAdhi on August 23, 2017 by T N Krishnan.